You know, I was going to wait to announce this after my guest linking event, but I’m starting to get a bit nervous. Blogathons are sprouting all over like dandelions! So I've decided to put it out there: we need to talk about Mary. The legacy of Mary Pickford has taken a hit lately. First the Pickford-Fairbanks Studio is demolished by developers, then there's this kerfuffle between The Mary Pickford Institute of Film Education and The Mary Pickford Foundation (which I still don’t fully understand). I’d like to celebrate this mighty woman. · She is to date the only woman to have had her own movie studio in Hollywood. · Her first marriage to Douglas Fairbanks, and the adoring crowds that accompanied them everywhere on their honeymoon, gave birth to the first celebrity couple. · Pickford was one of the first huge stars of the silver screen, and one of the most adored women in the world. · She was also was one of the first movie performers to drop the numbered poses of the melodramatic and often misused Delsarte method and act naturally for the screen. For this reason, her performances are still fresh today. I think that last point is really important. 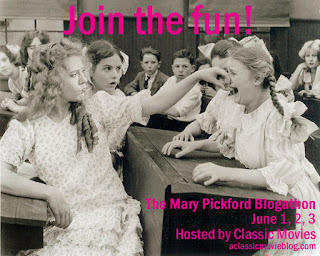 Mary Pickford was a funny, riveting and ridiculously entertaining performer. The little girl image may make her seem old-fashioned, but Pickford’s movies are alive; they pulse with her irresistible energy. These flicks are entertaining by any standards. It is easy to see why people loved her so much. 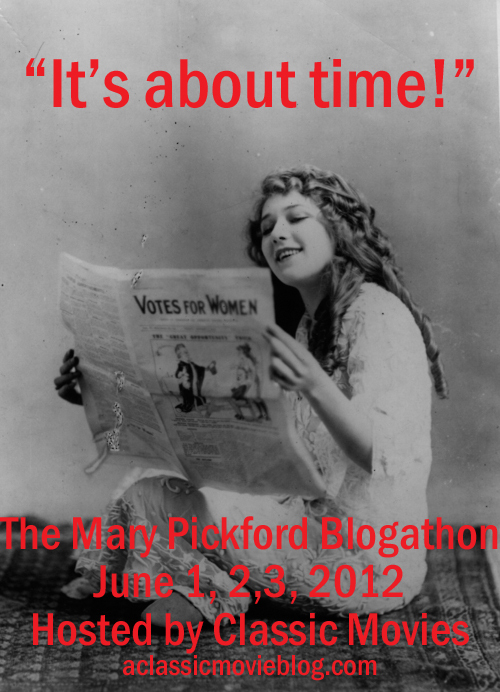 So on June 1, 2 and 3, I invite you to send me new and previously-published posts about any aspect of Mary Pickford’s life and movie career. You can either send them to me at classicmovieblog@gmail.com or post them here in the comments. If you haven’t seen any of Pickford’s movies, here’s a great opportunity to get to know her! Let’s do it for the memory of Mary! In answer to my question about how one makes those cool blogathon banners, the Mythical Monkey graciously responded by sending me several excellent samples. Since the versions I eventually made are an embarrassment to banners, I'm going with these. Thank you Monkey! Hey -- this will provide the perfect opportunity for me to unwrap my copy of Stella Maris! 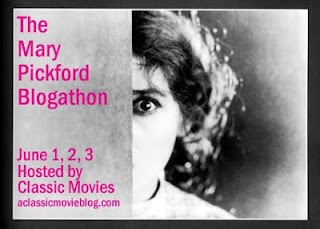 Excellent idea for a blogathon, K.C.! I know about Mary's role in the history of film and Hollywood. But am (shamefully) not familiar with her films. I'd love to participate in this, if possible. My film of choice for discussion is "Star Night at the Cocoanut Grove" (1934), her last film. Let me know if this choice/submission is acceptable. This is wonderful. I share Mary's films with LA school kids in our Mobile Film Classroom Silent Film bootcamp where we teach kids how to make their own silent film. They connect with her right away. I'd like to write how Mary makes an excellent role model for today's girls, through her performances and her life story. Mary was a totally modern woman. Yikes. Thanks Ivan. I'm delighted my proofreading lapse didn't scare you away. Manon-- Mobile Film Classroom Silent Film bootcamp? Where were you when I was a child? I'd love to interview you about that for the blog some day. For now though, yes, your topic sounds fascinating! KC -Where was any program like this when we were kids? It's the technology that makes it possible. The Mobile Film Classroom has been the primary educational outreach of the Mary Pickford Institute for Film Education. While I don't want to draw you into the current 'kerfuffle' between us and MPF, I do want to say we will continue the Mobile Film Classroom programs. Kids need to know about classic cinema as part of what it means to be literate in the 21st Century. Oh yes Manon, I'd rather just focus on the program. If you'd like to chat, I'd love to feature it. Just shoot me an email at classicmovieblog@gmail.com. Wow love to get in on this and discuss her version of The Little Princess! Also, if anyone's interested in doing her life I recommend the book Pickford: The Woman Who Made Hollywood. I read it for a film class and wrote a few papers on her and this book is fantastic! Wait, the blogathon isn't in 2102? Well, then I'm going to have to pick up the pace a bit. I'll send you an amended banner in a minute or two. Oh, I see -- you've already fixed it. And count me in -- how about a review of Amarilly of Clothes-Line Alley, which would actually fit in with my outlined plan of future posts! I'd love to do a review about Mary's Sparrows, from 1926. Sounds good Journeysinclassicfilm. Thanks for the book recommendation. Monkey--I couldn't figure out how to fix it, so I took it down. It's the one with her reading the newspaper. I liked it because of the "It's about time line." Do you think you could send a version for this year? No biggie if you don't have time! Good movie choice. I figured this event wouldn't take you too far off your usual path! Le--Sparrows is the movie that got me interested in Pickford! I'm delighted you'll be covering it. Ah the swan song Stacia--that'll be great! Matthew--that would be great! I don't mind if people double up on films, but Kiki is still uncovered. As I recall, your Cameos review wasn't glowing. I'm curious to learn more about it. It will give me a chance to be a little more generous than I obviously seemed... I love it, basically. It's just that it's the damnedest thing you ever saw. Okay Matthew, I read the review again, and I'm sort of getting the love. Just a hint of it though. So now I definitely want to hear more. It sounds like the sort of movie I would obsess over. Chris--thanks for getting in touch. I'm looking forward to your post! This should be fun! The first silent movie I ever saw featured Mary in a Biograph one-reeler. I've loved her ever since. -David W. Menefee, author of the new Mary Pickford book, SWEET MEMORIES. KC - I'd love to do a post on "The New York Hat" if that's okay with you! I'm curious to know what movie that was David! FlickChick--"The New York Hat" would be great. That's one of my favorite Biograph Pickford flicks. The Most Beautiful Fraud in the World would like to jump on the Pickford bandwagon here, so count me in. I will probably do a career overview kinda thing instead of any specific film. That would be great Kevyn. Thanks! Count The Hollywood Revue in! I'd like to do a review of My Best Girl. Good choice hollywoodrevue! Such a charming flick. Who doesn't love Mary? I'll probably do a profile of her and not a review if that's okay. Going to go add a banner at my place right now. Page--If it is going to be anything like your typical profiles, I am beyond excited! So happy you will be doing this. Don't know how I missed this, but I would love to throw my two cents in on The Poor Little Rich Girl over at True Classics. Wonderful Brandie. I just watched this on Pub-d-Hub the other night. The scenes with that bratty playmate are hilarious! I have only seen one Mary Pickford film in my life, but it has had such a profound effect me and my writings that I would be remiss if I didn't participate in this. I will have a post ready on my blog for June 1st! Manon told me about this, and it sounds GREAT. So you can count me in. If I can finish packing, I think I might enjoy writing something about Mary and her mother Charlotte as producers. They were really quite a team. Wonderful! So nice to have you on board Hugh. Mary and her mother were definitely an amazing team when it came to any sort of business. I'm glad Charlotte will be getting some attention. That's great WhatHappnd2Hollywood! If you want to share what you'll be writing about, that would be cool, but you don't have to. Glad to have you. Thanks for making it official Judy. I'm so glad you are covering Daddy Long Legs. It's one of my favorites!